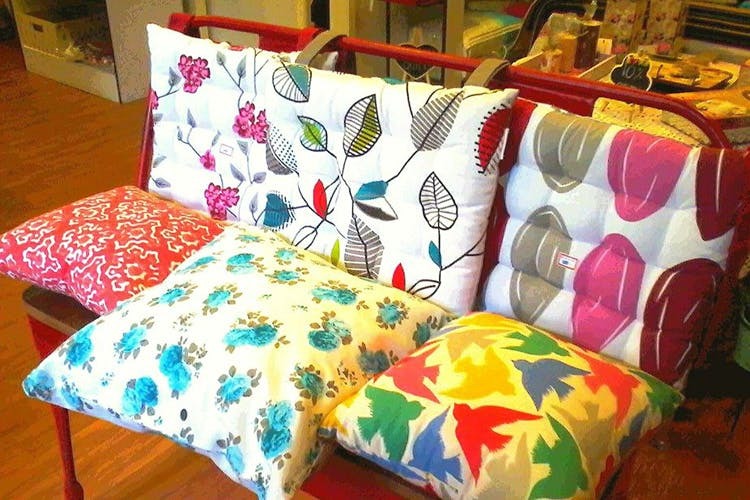 A lovely, little store in Kalyan Nagar, Jar of Hearts is perfect for when you want to pretty up your home on a budget. From curtains to candle stands and planters, they have plenty that you can choose from. Tucked away at the end of a busy Kalyan Nagar lane (on the same road that Aioli BBQ is), Jar of Hearts remains little known. But for those of you on the lookout for home decor on a budget, this is a great place to start. They have quite the variety especially when it comes to living room essentials and table linen. You can spruce up your living room with breezy curtains that come with owl prints or sofa throws that’ll encourage you to curl up with a book. There are also pillows and seat cushions for your workspace. You can also pick covers in a range of prints, from floral work to contemporary art. Add zing to your kitchen with their cheerfully designed mittens or tea cosies. You can even snap up fridge holder covers and table mats for your dining space. The rest of the store is made up of various knick-knacks. Colourful planters, peg boards, photo frames, and jars and vases from Channapatna are all available.